Basic Information: What is BioHair Capsules? This review for BioHair Capsules provides customers with all the necessary details that are important to know before purchasing this product and have knowledge regarding the feasibility of this product. 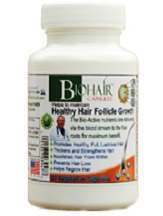 These capsules are rich in Biotin which is responsible for hair growth as well as for overall health of nails and skin. It is available on the product’s website as well on other online shopping websites. These capsules are absorbed into the blood stream and help in reducing the DTH levels that are responsible for hair fall. The main ingredients are Biotin which is responsible for healthy growth of hair and the other significant ingredient is horsetail plant which is known to have high silica content. The other ingredients that are present are Vitamin A, other additional B vitamins, Folic Acid and Zinc. One has to take two capsules a day but there is no mention regarding how to take it- with meals or without. It is recommended that one takes these capsules for a period of 90 days to see the difference. The product is priced at $39 and there are no offers or combinations that are provided by the shopping sites. I have been taking these capsules for past one month and I can see a difference as my hair fall has reduced. I have been experiencing hair fall due to stress and these supplements have resulted in a slight improvement to my hair fall concerns. I will continue the supplements up to 90 days in total to see if there will be any further improvements. Although there is no mention of any side effects or any kind of precaution that needs to be taken, it is recommended and advisable to consult a doctor before taking these supplements as there can be ingredients that may not be suitable to one’s body. Since this supplement is for adults, it is best kept away from children. There is a money back guarantee offered by the manufacturer if the product does not satisfy the customer and no questions will be asked. There are no customer reviews available either on the products website or on any of the shopping websites to substantiate the claims made by the product’s manufacturers. Although the product claims to work really well on women and men’s hair loss problems but it also lists out the various causes of hair fall on which it works best. It also tells the customer that there can be cases on which the product might not work at all. The lack of customer reviews and feedback makes this product less viable an option to buy. There are no offers along with the product and it makes it quite an unattractive purchase from the eyes of a customer. The lack of information regarding how to take these capsules is also something to deal with. One has to consult a doctor regarding the dosage.